The coming of Alaska’s spring is known as “breakup,” and by the time you read this, it should be in full swing. River ice will be soft, snow will be melting from the tundra, and the unpaved streets in Nome will turn to a gloppy mud that’s the consistency of pudding. It’s impossible to predict with accuracy, but long-timers believe that our ocean ice will probably remain with us into June. By the second week of June, however, we may begin to see a few of the Arctic’s plants begin to return to life. As we joyfully await nature’s brief awakening, we thank you for your kindness to the thousands of people whom we serve. We are proud of the many awards which KNOM has been given, but our greatest honor is your thoughtfulness toward our mission. Thank you! In this Internet version of the Nome Static, we're happy to include extra photos and information that wouldn't fit into the paper edition. We hope that you enjoy reading it and learning more about our work and the people whom we serve. FRESH VOICE: (left) In KNOM Studio C in April, Esther Kimoktoak (kim-OCK-twuk) chats with public affairs director Amy Flaherty for an upcoming “Elder Voices” program. 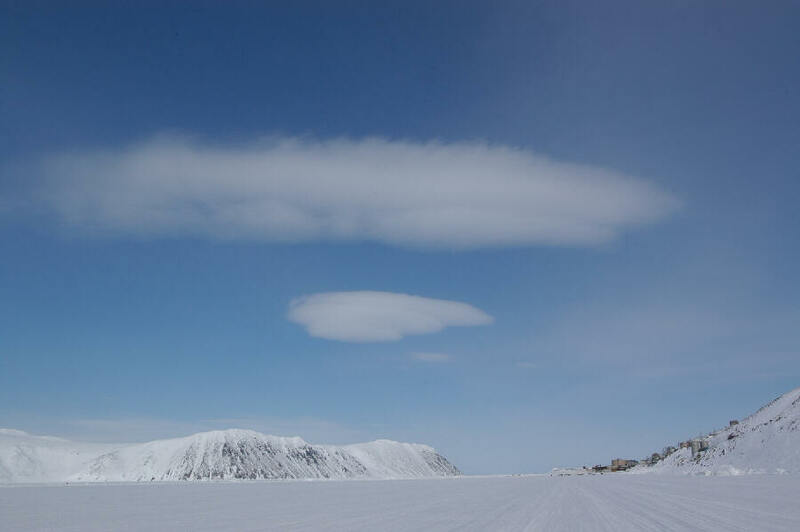 Esther hails from Koyuk, a village of 350 people 130 miles east of Nome, in an area that’s been inhabited for at least 6,000 years. At a young age, Esther and her fiancée drove a dog team 20 miles to the nearest magistrate, and were married with no ceremony. Fifty years later, their children organized a fancy wedding with all the trimmings. 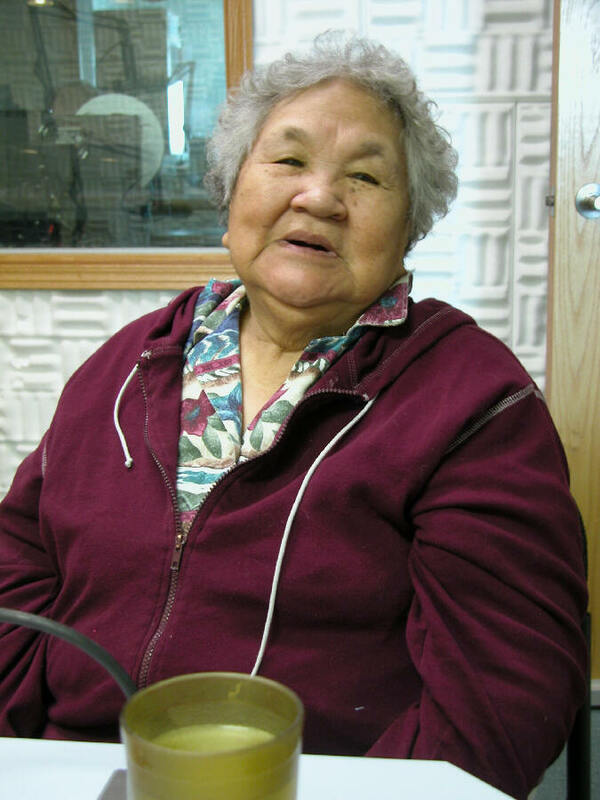 Esther also spoke about subsistence food gathering when she was a child. The family's only greens were what they could gather from the tundra. She described using a long stick to pull in greens that stuck out about five inches above the surface of lakes and ponds - in total, about a foot in length. They'd pack these greens home, and Ether's grandma would then boil them with sugar and seal oil. Her interview took place on the day after her 76th birthday. Thank you to everyone who suggested this, and thanks to each of you for supporting our work. KNOM is the oldest Catholic radio station in the United States, tirelessly serving western Alaska since 1971, thanks to generous people like you. INSPIRATIONAL SPOT: Lord, may nothing distract me from Your Love. Neither health nor sickness, wealth nor poverty, praise nor criticism, long life nor short life. May I never seek or choose to be other than You intend me to be. (Left) The tiny, extremely isolated village of Little Diomede (DYE-uh-meed) clings to the base of a beach-less island in the Bering Strait. EDGE OF THE WORLD: It may be the most remote community in the United States. Its hardy 130 souls are loyal KNOM listeners. In fact, you’ll hear stories of villagers gathering in the small Catholic Church to pray along with the KNOM radio Mass. It’s Little Diomede Island. Just 2-1/2 miles away across the International Date Line lies Big Diomede Island, a Russian military outpost. 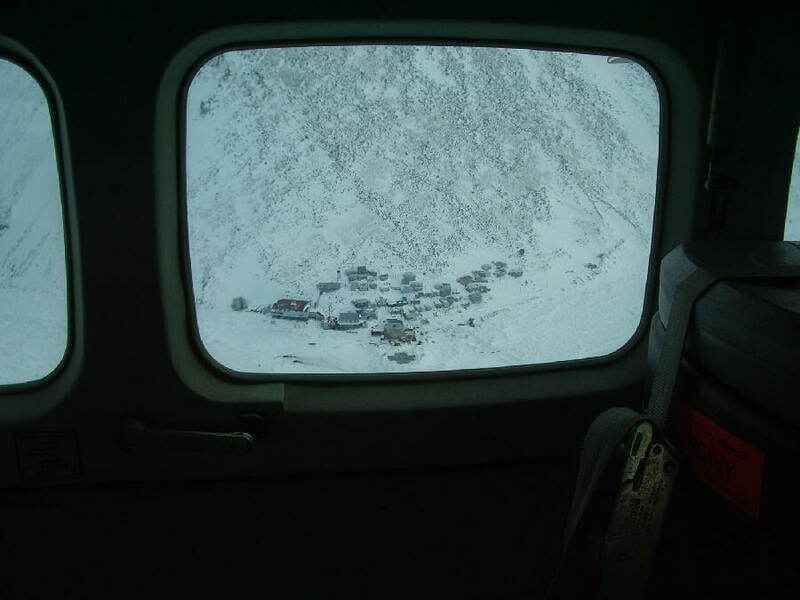 Little Diomede is one of two places you can see Asia, and tomorrow, from North America. Most of the year, Diomede is accessible only by a small weekly mail helicopter, and by tiny open boats, traditionally fabricated of driftwood frames covered by stretched walrus skins, which ply the 28 miles to mainland Alaska. 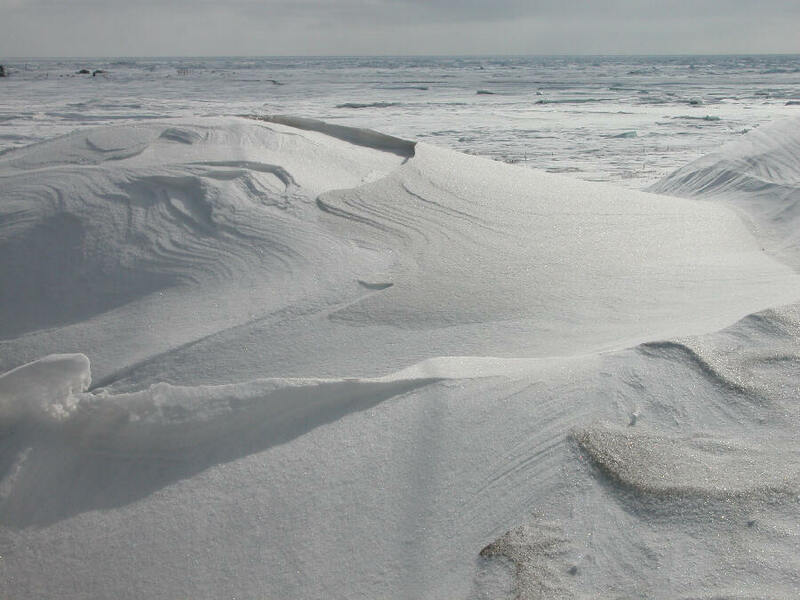 Winds and currents are strong, and the ocean ice shifts and grinds. In mid-winter, however, the ice often freezes sufficiently hard for villagers to bulldoze a landing strip which often sits right on the Date Line. That’s how KNOM volunteer news reporter Jesse Zink traveled there. Like many visitors over the years to this distant point, he discovered that weather is the boss, spending an unexpected extra night. Weather has been known to prohibit travel for a month at a time. (Left) Little Diomede as it appears from the ocean ice. (Left) American Little Diomede Island is at the right, and Russian Big Diomede is at the left. The Bering Strait and the International Date Line run between the two. Looking at Big Diomede, you are actually seeing tomorrow. INSPIRATIONAL SPOT: If prayer is only a last resort, then we are thinking of God as a repairman. 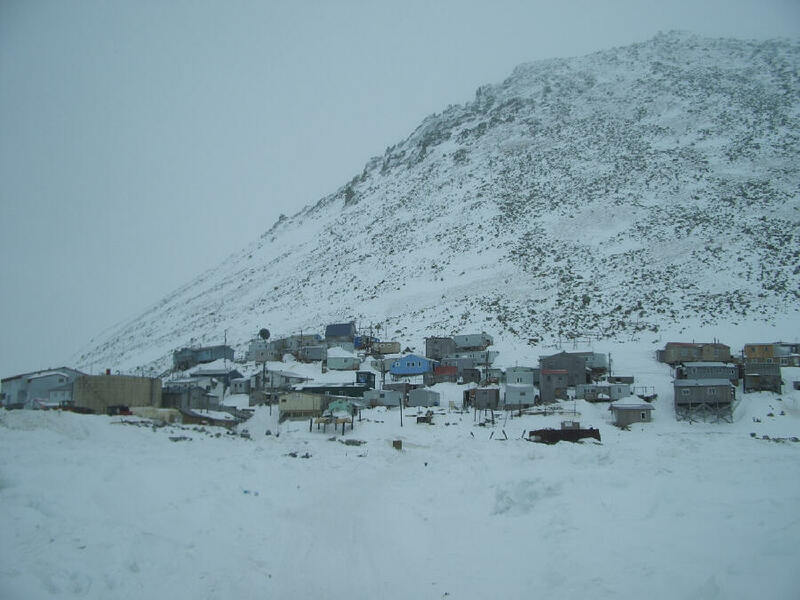 The people of Diomede subsist as their ancestors did for centuries, living off the bounty of the frigid ocean. You’ll find seal and walrus on the dinner table, as well as crab, shore birds and their eggs, fish, whale meat and polar bear. By tradition, virtually every part of every animal is put to some use. (Left) It will be a while before the children of Little Diomede get to enjoy the village’s swing set. The greatest source of cash is ivory carving and other Alaska Native art, at which Diomeders excel. You won’t find much money in the village, and the homes are tiny and quite spare. Nonetheless, it is an existence which they cherish, eking out a living much as their Ingalikmiut (in-GAH-lik-myoot) Eskimo forebears did. 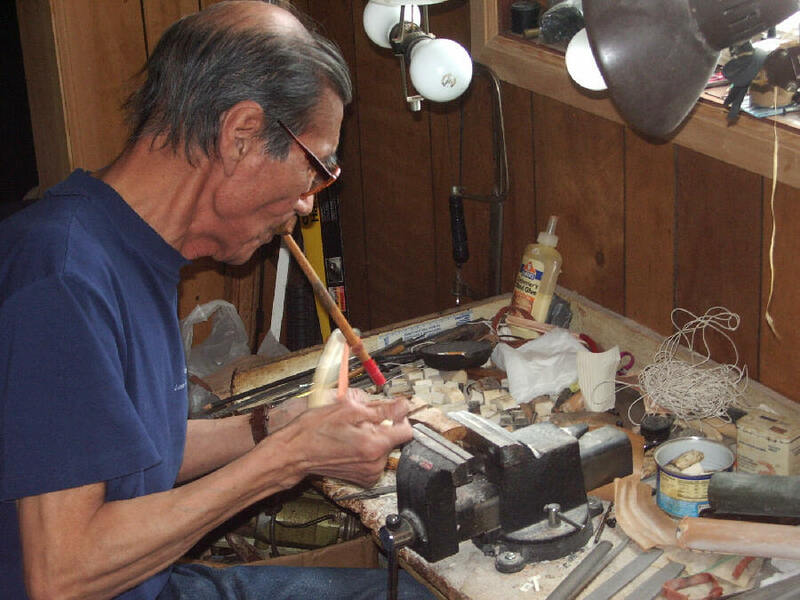 (Left) Diomede mayor Pat Omiak, Sr., uses a traditional drill while making a bracelet of walrus ivory. Jesse observed “it’s easy to go sledding when your entire community is on a steeply-pitched rock face.” Also, some of the older children were ice-skating ¾ on the runway! Why travel to this often inaccessible bit of rock? There was an opportunity, and Jesse jumped at it. Of course, the trip wasn’t all play. He interviewed Diomeders, and developed some interesting news stories as well. Heaving permafrost is moving houses. Animal migrations are changing. It’s for people like the Diomeders that KNOM exists. Thank you for making KNOM possible! For many years, we have prayerfully placed all bequests into funds that are used only for major improvements and to meet future emergencies. INSPIRATIONAL SPOT: Lord, when I am weak, help me to remember that You are strong. When I am afraid, help me to remember that You are with me, and when You are with me there is nothing to fear. 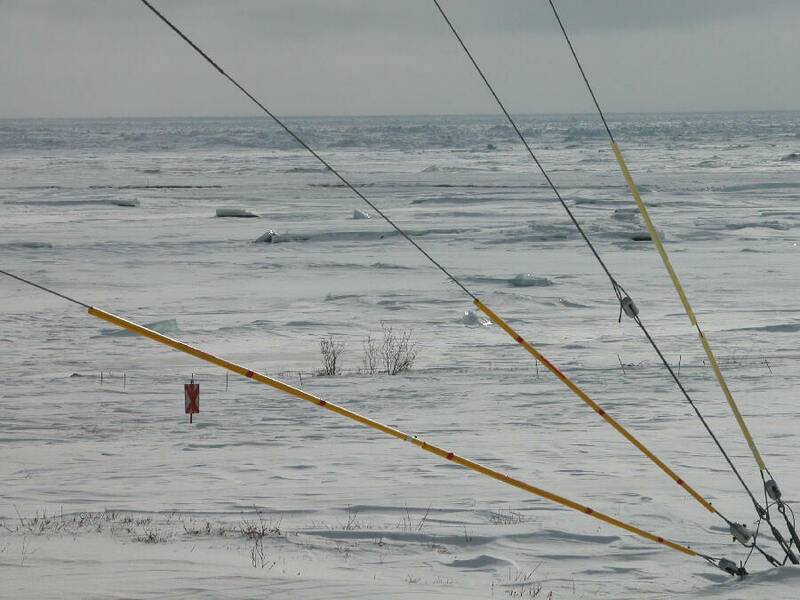 WE GOT THE DRIFT: (left) In April, snow was drifted 8 feet high at the KNOM tower. The uprights are 16 feet tall. Above the 8-foot level are ropes. 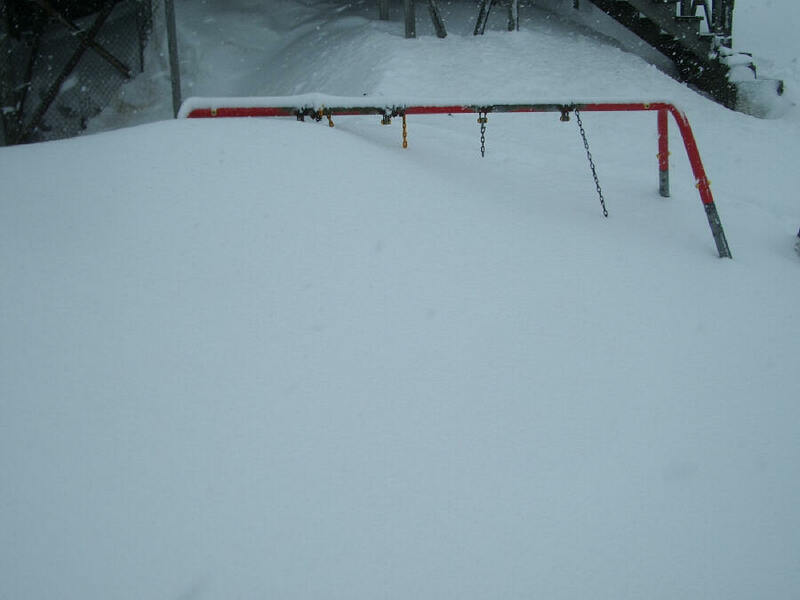 (If the full fence was 16 feet, we believe we would have a 16-foot drift! 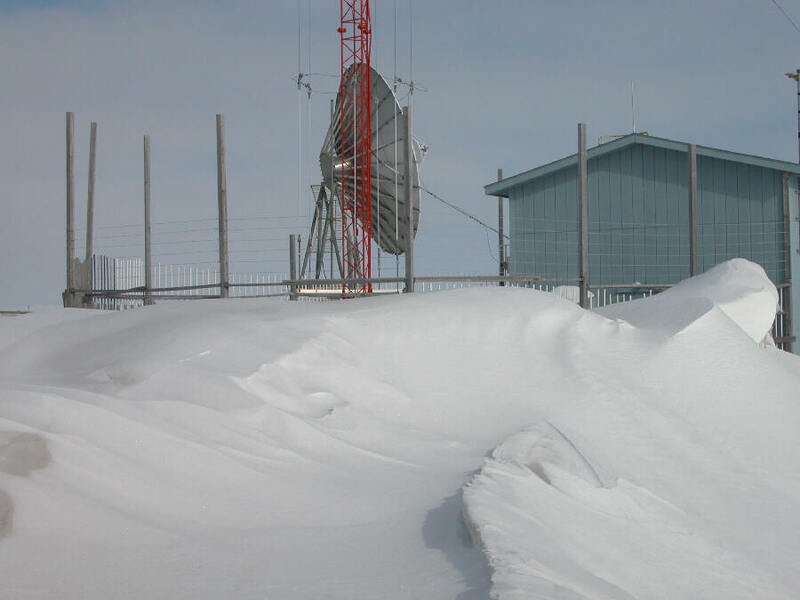 (Left) An eight-foot high drift of hard, wind-packed snow presents an interesting sculpture near the door of the KNOM transmitter building. (Left) Beyond KNOM's southwestern guy anchor lies the mouth of the Nome River, and beyond that, the frozen Bering Sea. All of these pictures were taken in April 2006. THIRTY YEARS AGO: In May 1976, due to the long summer sun, KNOM lengthened its broadcast day to 20 hours, an increase of two. 14,100: That’s how many inspirational spots KNOM has broadcast so far during 2006. And how many educational spots we’ve aired. Of course, we’ve broadcast the Mass and Rosary, and many other valuable programs, too, entirely thanks to you. 128: That’s how many military reservists provided dental and medical care and 1,000 free eyeglasses to villages during their 2-week annual exercise in western Alaska. There were Black Hawk helicopters all over the place! KNOM provided the greatest part of their publicity. SUBJECTIVELY: Topics covered on KNOM news and interview programs this past month included job training opportunities, tuberculosis, state spending in rural Alaska, declining crab populations, and the value of conferences for isolated and far-flung communities. One call-in show invited listeners to talk about their personal heroes. Many honored their parents and grandparents. Another program asked listeners what they would like to tell their state legislators. Following the show, producer Liz Recchia sent those comments along to state senators and representatives. Educational spots this month treated subjects like music history, drunk driving, smoking, safe water, sanitation, the origin of place names, sexual abuse, Alcoholics Anonymous, Alaska science, parenting, Alaska Native history, health, successful youth, history and violence against children. Once more, thank you so much. May Our Heavenly Father bless you abundantly for your kindness to our work! Copyright &COPY; 2006 KNOM. All rights reserved.